See the San Diego sights at your own pace in this easy-to-navigate 2-passenger GoCar. Choose from a selection of itineraries and tour lengths, including a 1-, 2-, 3-hour or full-day rental. Then maneuver your three-wheeled GoCar through downtown, the historic Gaslamp Quarter, Balboa Park, San Diego Zoo and more. Don't worry about navigation: The vehicle’s talking GPS always knows where you are, even if you don’t. This open-air self-drive tour offers independent travel with guided GPS and narration. 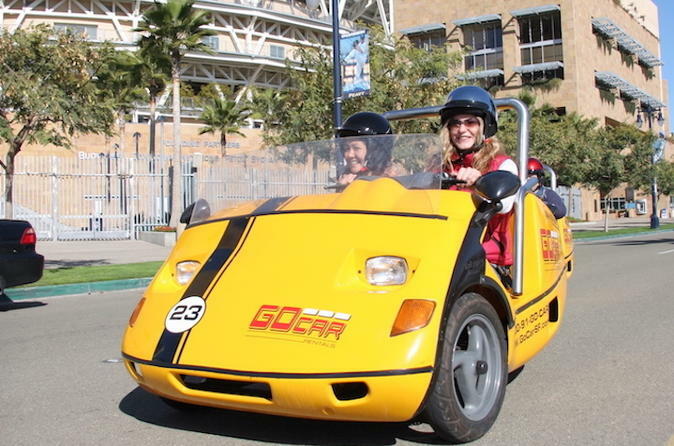 Explore San Diego sights on your own schedule in a cute 3-wheeled, 2-passenger GoCar. Simply pick up your vehicle, see what you want as you make your way around the city, and bring the GoCar back when your time is up. Explore parts of San Diego that tour buses cannot go on a self-drive tour that can take from one hour to a full day, depending on which booking option you select. Parking is hassle free due to the GoCar's small size, and in San Diego that's a huge bonus. You can even squeeze the tiny vehicle into motorcycle parking spots. You will receive helmets and a briefing on how to operate the car before you head out; no previous GoCar driving experience is necessary! Each car seats two and has a lockable trunk to keep your belongings safe. The talking GPS provides clear directions and informative facts on notable sights, highlighting specific locations throughout San Diego as you drive. Suggested routes and time options are listed in the Itinerary section below. Price is per person, based on two passengers per GoCar. The following itineraries are only suggested GoCar routes. Your self-guided tour’s length may vary due to circumstances such as departure time, location, traffic and sightseeing. Upon pickup, GoCar tours can be customized with the sights you want to include.